The energy of a late summer metal tour can be palpable, especially if the package includes a band that you’ve been into for years and finally hits an area close enough to experience live. 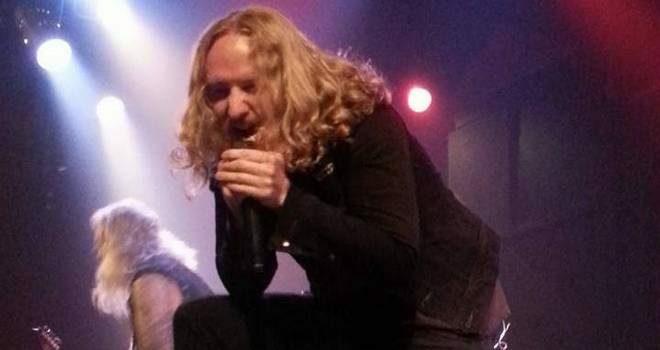 Months back when this second US tour run for Dark Tranquillity would be announced, the fact that thrash veterans Warbringer would be in the special guest slot sealed the deal for mandatory attendance – but Canada’s melodic/power metal upstarts Striker just made this a three-act package for the best cross-section of attendees to consume. Whisking off my New England stomping grounds with fellow scribe Matt Bower in tow, we would meet outside the confines of The Chance Theater once again for a Thursday night lesson in the power of heavy metal live and in the flesh – taking in a couple of hundred attendees young and old (truly fitting that 10-60 enduring appeal of the genre). Local openers included two bands covered a decent amount on this very site – Vision Serpent and Dark After Dawn. They both received modest enthusiasm and respect from the growing number of patrons in the building – definitely moving beyond the normal friends/family cordial vibe most locals get on these opening slots. Both would mix up a set of originals with a cover track – Vision Serpent choosing to invite Dark After Dawn vocalist/guitarist Maruf Kamal onstage for support on their version of Sepultura’s “Refuse/Resist”, while Dark After Dawn brought the house down with Slayer’s “Raining Blood”. Dark After Dawn possess a relatively fresh rhythm section, the new drummer especially adding a versatile groove approach to the band’s heavier thrash style to diversify the sound in a much more dynamic way. With work on an upcoming album lurking for early 2018, they should hopefully break out beyond the upstate NY metal market with a wider following. Striker has been one of Canada’s latest must-see bands – unafraid to rile up the crowd with their addictive, anthem-template of songs that can be traditional heavy metal one moment, speed/thrash the next – never forsaking twin guitar harmonies and superior melodic vocals to tie the material together. Given only thirty minutes, they didn’t waste any second in their seasoned, ready for arena attack – using two fog machines to accent certain hooks numerous times as well as engaging in unison, synchronized stage moves. Vocalist Dan Cleary has that magnetic voice and proper attitude to coax the crowd into the material – the band also using four-part vocal harmonies during the gang/chorus hook lines. Choosing to concentrate on their latest, self-titled album and the previous Armed to the Teeth and Stand in the Fire records, even to the uninitiated tracks like “Former Glory”, “Phoenix Lights”, and “Fight for Your Life” brought out the headbanging, sing-a-long days of yesteryear, proving the timeless, enduring quality of basic heavy metal will never die. A relentless touring schedule across Europe and North America is paying dividends, as they walked away with a slew of new Striker converts. Deciding to join fellow DR scribes Matt Coe and Kyle McGinn for the Dark Tranquillity/Warbringer/Striker tour stop at The Chance in Poughkeepsie, N.Y., this would be my first visit to the venue. A 700-capacity theater, the setup is unique, with a dining area complete with tables and chairs taking up half of the floor space in front of the stage, but with still enough room to get the bodies moving in the pit when called for. Next up was Dark After Dawn, employing an aggressive double-axe thrash attack complete with frenetic riffing and twin-harmony lead bursts. Although the band’s material was fresh and exciting throughout, no one complained when they ripped through “Raining Blood” in the middle of their set. Looking forward to hearing more from these guys. It was hard to ignore the large STRIKER banner hanging on the stage, announcing the first of this diverse three-band touring package. Truth be told, as much as I am a big fan of Warbringer and Dark Tranquillity, the main reason for my attendance on this tour was Striker, as I had been waiting years to see the Edmonton quintet. 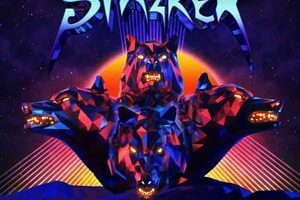 Taking the best elements of traditional, power, thrash, speed and ’80s anthems and combining them with eargasm-inducing melodies and a fun, party atmosphere, Striker has all the makings for an over-the-top heavy metal party! From the first note of “Former Glory,” the opening track off the band’s self-titled, fifth album, Striker grabbed the audience by the throat and never let go. With minimal banter in between songs, the band sliced and diced its way through seven selections, concentrating mostly on their last two albums, the self-titled and “Stand in the Fire.” One of the band’s many strengths is the harmonizing, gang-shouted vocals that you can’t help but sing along to while raising fists and horns high into the air. There was no shortage of them, as the band members flew about the stage wearing big grins. There was just enough time to catch our breath before the pummeling from Warbringer. With 50 minutes at their disposal, in a decidedly bold move, the band decided to play their new album, Woe to the Vanquished, in its entirety and they were rewarded for that decision with enthusiastic applause, plenty of whirlwind and circle-pit action and loud cheers. Woe to the Vanquished is a tour de force of a record that expands the band’s sound well beyond thrash, featuring everything from Swedish death metal (“Divinity of Flesh”) and black metal flavorings (“Spectral Asylum”) to an all-out, 11-minute epic (“When the Guns Fell Silent”). Beyond the infusion of multiple influences to round out their expanded sound, Warbringer is first and foremost a thrash band and they showed why they’re one of the best in the biz with straight-ahead scorchers such as “Silhouettes” and “Shellfire” as well as “Combat Shock” and one of the best thrash riffs ever penned in “Remain Violent.” Not even the microphones shorting out a few times could sap the energy from this high-octane set. Dark Tranquillity needs no introduction. One of, if not, the most consistent pioneers of that beloved Gothenburg melodic death sound, DT over the years has found ways to broaden that foundation without ever forsaking quality or losing their identity. Supporting latest offering, Atoma, the band unleashed a 20-song set spanning their rich discography, blending old with new, fast with slow, and heavy with mellow, all with that signature dark atmosphere and those melancholic melodies. Not much to be added about this evening’s festivities that hasn’t been covered by Matt and Matt above – be it the quality local acts Vision Serpent and Dark After Dawn to start the night, the fun of Striker’s set, or the abrasive thrash of Warbringer. A strong and varied billing that warmed everyone right up for Dark Tranquillity. Having caught Dark Tranquillity last November in Clifton Park, the biggest plus about this night’s set is that it wasn’t a reduced one. Having missed out on a few tracks (notably “State of Trust”) last year, it was excellent to experience the full setlist. Despite a number of touring help (Christopher Amott being one of them) and some fairly new blood within the DT ranks, they always pull off consistently high marks in the live setting. We were treated to five cuts from the band’s latest Atoma (our DR collective album of the year for 2016), the pick of the litter had to be “Clearing Skies,” which featured Amott jumping right front and center for the glorious melody that hits before the chorus.